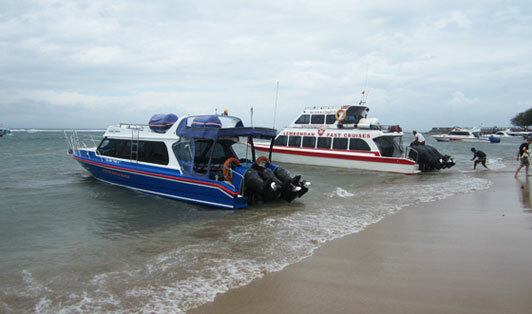 Sanur Beach is the departure/arrival point for many trips between Sanur, Lembongan, Lombok, and the Gili Islands. Ninety per cent of our trips involve a hotel pick-up, so locating your departure point is actually a really simple process - just follow your guide! The boats are located at the end of Jalan Hangtuah where the road meets the beach, just to the north of Sanur. It can be a little crowded so our advice is to stick close to your fast boat operating staff, but we think you'll find the boarding process quite straightforward. In terms of the logistics, the boat staff are really helpful and will graciously help both you and your luggage onto the ferry boat. Most boats are going to leave from the beach shore itself, so prepare to get a little wet up to your knees - it's all part of the fun! It's a simple step up to the boat, though, and they are all made for easy boarding.